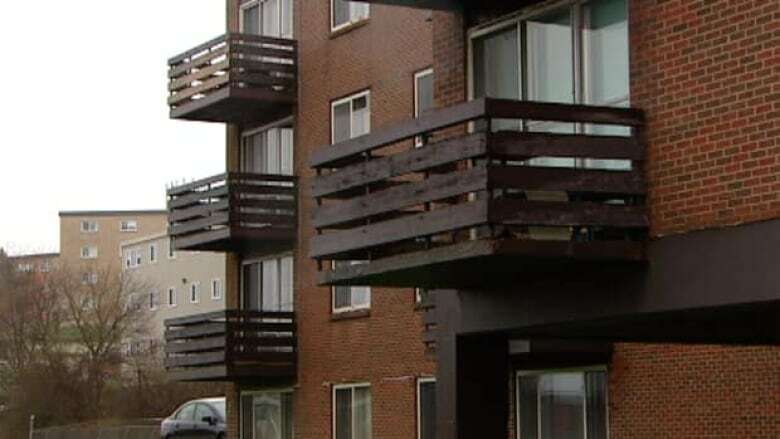 Hundreds of people in north-end Dartmouth, N.S., have been told to stay off their apartment balconies because they're unsafe. Mary Ann Walker said a few days after she moved into her apartment unit — seven months ago — she got a warning notice from the company that managed her building at the time. "Due to a recent preliminary visual inspection of the balconies by a professional engineer, we must advise you not to use your balcony until we can determine the extent of any necessary repairs to ensure the stability of your balcony and your safety," said the letter, dated Oct. 21, 2010. "For your safety, please do not go out on your balcony for any reason until further notice. There is potential for structural failure on some balconies." "We don't go out and spend time on the balcony just for the fear that it can fall at any time," Walker told CBC News on Tuesday. "A lot of it's how it's attached to the wall or the masonry outside for most of them. Some of them if you went to see them, you could look right down through them." Walker said the balcony issues are the least of her problems — she has also had problems with her fridge, her stove, her tap water and water damage. "It wasn't there when we moved in but shortly thereafter we started seeing the bubbling and all the issues with it," said Walker about the water damage. "How many people do I have to go through to try to get answers? I'm promised everything but the promises never come through." A spokesperson for Service Nova Scotia and Municipal Relations said tenants can ask for a hearing and a building owner can be order to fix such problems. "We're either going to have to move or what do you do? There's no solution here," said Walker. Kelly Hanczyk, the CEO of TransGlobe Apartment REIT, contacted CBC News on Tuesday and said he commissioned an engineering report on the faulty balconies in November, although he conceded that likely was not communicated to the tenants in his buildings. Hanczyk said he expects to have the engineering report within a week and he will order repairs after that. Tenants should see construction work begin later in the spring.